Miami, one of the world's top notch travel destinations has got so many places to check out before you go. Here are the top three of them! Before you throw yourself on the beach and enjoy the Miami sun and parties to the fullest, you should have stroll in Lincoln Road since the place is considered as a landmark and one of the first things to come mind when it is about Miami. Lincoln Road, which used to be a mangrove forest back in the beginnings of 1900’s, is now considered as the city center. The road is filled with galleries, cafes, shops and malls and sort of summarizes the daily life of Miami. It is almost always very crowded since the visitors outside from Miami checks the place out. There are many upscale restaurants alongside Lincoln Road and since the road is closed to vehicle traffic, most of these offer the option of dining outside. You can people-watch and enjoy your meal at the same time, or maybe shake the stress away of a busy day filled with meetings with a glass of your favorite drink. One must also note that Lincoln Road is popular not only among the visitors but also among the Miamians. It is also a great place if you feel like dancing or check out Miami’s night life scene (the not sandy part), Lincoln Road offers a great deal of options to choose from. Called SoBe by the Miamians, South Beach is probably one of the most desired places to be in by most of the people in the world and you have to make sure you make the best out of it when you are there. 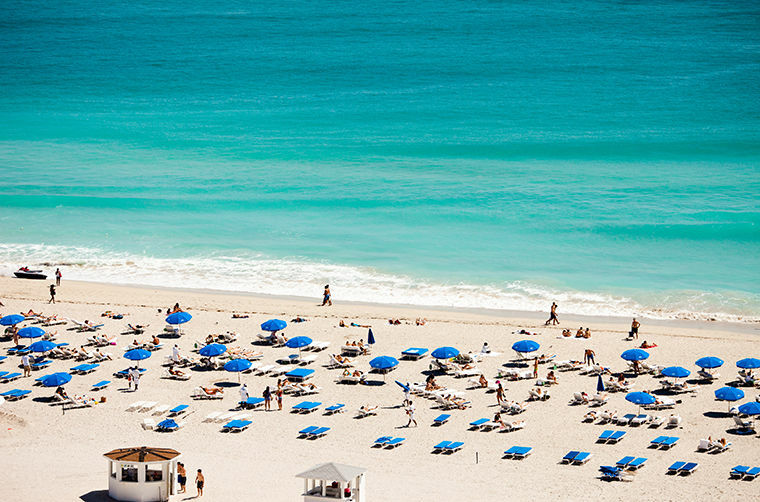 South Beach is the name given to a neighborhood in Miami, don’t expect to visit one single beach that is named so. It is the area between Biscayne Bay and the Atlantic Ocean. The place was not this popular back in the time however the investments and the improvements made in the neighborhood changed the character of the place from a regular ocean side living area to the one of the most fascinating holiday spots not only in the States but also in the whole world. There are numerous clubs, hotels, restaurants and boutiques along South Beach. Thanks to the bright and always shiny climate of Miami, it is crowded not only during summer months but year round. South Beach has got parks you can choose from to experience one of the most exciting swims of your life. Miami is a multi-ethnic city. You are going to hear tens of different languages spoken around you while you are touring around the streets. This adds spice to the natural beauty of the city. In addition, this also reveals places in the street that is definitely worth a try. One of these is the Little Havana. The Cuban community as well with the many residents from Central and South America living in Miami calls this part of the city home and as the years passed, the area had gained more and more popularity among the foreign visitors since it is a great chance to experience a different culture which is quite far from the Miamian one. Little Havana is also famous for the festivals held in that part of city throughout the year including the famous Calle Ocho Festival, which makes it even better for the visitors if they happen to be there in that time of the year. There are also a large number of attractions to choose from in Little Havana. You can enjoy a drink and one of the best Cuban cigars if you want to in this little part of Miami.